Despite the intended insinuation, sucralose is not a form of sucrose (cane sugar). Sucralose/Splenda is produced through artificially substituting three hydroxyl groups (hydrogen + oxygen) with three chlorine atoms in the sugar (sucrose) molecule. Natural sugar is a hydrocarbon built around 12 carbon atoms. When transformed into Splenda it becomes a chlorocarbon, in the same family as deadly pesticides like DDT, insecticides, biocides, disinfectants like Chlorox Bleach, and WWI poison gas like dichlorourea. 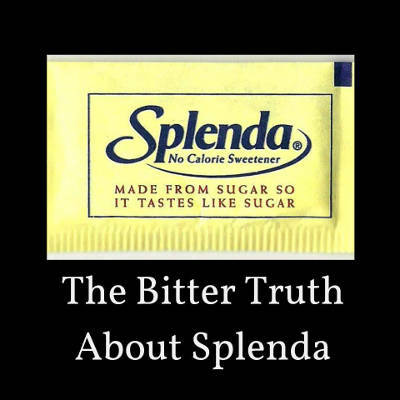 The makers of sucralose/Splenda argue that this “remarkably stable” chemical passes unchanged into the urine and feces, when in fact, up to 11% to 27% is absorbed into the body (FDA, 1999).